Will your world change after midnight? 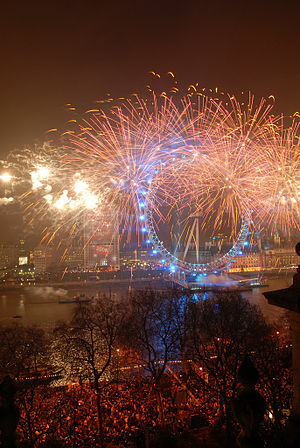 Every New Year’s Eve there is a global feeling of anticipation that changes are afoot. No matter where you are, who you are with or what you are doing, it is almost impossible to miss the dawning of the new year. All around the world there are massive celebrations, huge displays of fireworks, parties arranged and a feeling of camaraderie that only exists for maybe even just a few minutes either side of midnight. If you are in a large city or even at a local event, complete strangers may well hug and kiss and you and wish you a happy new year. And then, the morning arrives, and all is back to normal. What happened to the optimism of the night before? Where has the camaraderie gone? Is there any perceivable change in your life from yesterday? No other species on our planet celebrates New Year. I’ve never seen sheep dancing in a field at midnight! So why do we feel the need to make such a big deal out of a change of year in our calendars? Is it that we have an intrinsic need to focus on the possibility of change for good? Is it that we are dissatisfied with our lives and want a better future? Why is there such a negative spin in our news through most of the year, and maybe just a glimmer of positivity on New Year’s Eve? Why do we look forward to the New Year rather than spend time celebrating the year we have just had? How many people will look back at the year that is coming to a close and be thankful for the experiences they have enjoyed, the spiritual advances they have made, the new friendships formed, the new lives that have begun, the understanding and compassion that has been shown to them, or they have shown to others? It always feels to me that it’s all about looking forward to the new and getting rid of the past. What a shame. I just read a wonderful blog written by a woman who has been making huge changes to her life. About accepting that she didn’t have to be superwoman after all, that she can feel free to follow her dreams. I felt that this arrived in my inbox at just the right time to be included in this end of year posting. She importantly mentioned the notion of ‘having it all’ and as I commented on her post, I thought long and hard about that well used phrase. Why can’t we have it all, I wondered? But, most importantly, we first have to qualify what having it all truly means to each of us individually. It will be different for each and every one of us. None of us have to adhere to the classic examples portrayed in the media, to the general consensus, to society’s view of what this phrase means. No, we can take it and shape it to suit us. My interpretation of having it all had to change drastically when I became chronically ill, when my life had no option but to become smaller. Suddenly, having it all had to alter to fit in with my physical capabilities. My expectations had to change. It took a long time to adjust, but now I can say I truly feel fulfilled, feel loved, respected and accepted. I am true to my beliefs, to my spiritual goals, to my souls desires. That to me is having it all. I don’t try to be something I’m not and hope that I don’t expect that of others. My days of trying to be superwoman are long gone! Instead of only focussing on what the New Year may bring to our lives, just on New Year’s Eve, why not think of every new day as the dawning of a new year. Feel the optimism and the camaraderie with others throughout the year. Consider what we, those we love and those who are in need, really require, and try to work towards that. When we go to sleep at night remember to thank spirit for the positives we can take from the day and ask what our expectations and intentions should be for tomorrow. Look at our lives and learn from our experiences. Feel if we have managed, in our own way, to have it all, even just for that one day. Sense if we have inspired others and if we have been at all instrumental in them finding fulfilment in their lives. Many people spend much time in thought and then make long lists of resolutions for the new year. Maybe they find that the list will motivate them to bring about change in their lives. Maybe their resolution list is in fact more of a wish list. How many of us have written this list and targeted massive changes that are due to take place from 1st January only to give up within a matter of days or even a couple of weeks? The resolutions soon become forgotten. So, for this change of year, as the clock passes midnight, and 2011 becomes 2012, I am not going to make a resolution. I am instead going to make a promise to spirit. I will promise to treat each day as a new dawn knowing it has the spiritual potential for the greatest of expectations. Previous Blogger Awards!!! Next 29) Always Look on the Bright Side of Life! I enjoyed this piece very much, not just because I always enjoy your writing, but because of what I just experienced. I had lunch with a good, long-time friend and then she came back to my house for some more chatting about the year gone by and our hopes for the year to come. I’ve been through some challenges this year, mostly self-inflicted, so I’m particularly looking forward to another new beginning. My friend said something interesting. She said that it’s almost as if we’re standing at the edge of a precipice and just a short leap away is the other side, which represents a new chance to change our lives for the better. We hesitate for a moment and then, at midnight, we jump, hoping that all the “bad stuff” will fall into the void between the two sides. I agree with you that we can do this at any moment, not just at midnight on the 31st of December. But since it IS the 31st of December and because my friend was with me and it just felt right, I asked her to pray with me that we would both make it over the precipice letting all our fears and tears and grudges fall away as we jumped. I think it’s the most positive thing I’ve ever done on a New Year’s Eve! Thank you for all your inspiring words! I want you to know, as the old year dies away and the new year is born, how very much you are appreciated! Happy New Year, my friend! How fantastic for you and your friend to share the jump, to experience this together, and I’m so pleased you made it over the precipice in one piece! What a fabulous way to celebrate the new year! Thank you for your comments on my blog, and knowing that you find my words inspiring make every moment that I sit here typing so worthwhile! Happy New Year …. and I hope you continue to jump whenever you feel the need!